Sober Look: The US housing market is not "a chicken-and-egg problem"
The US housing market is not "a chicken-and-egg problem"
NY Times: - The economy will not recover until the housing market recovers, and the housing market will not recover until the broader economy recovers — a chicken-and-egg problem reflected, once again, in national housing figures. And that may indeed be the case if it wasn't for the US demographics. It's hard for many to accept the fact that the US population did not stop growing after the financial crisis. At the same time new home construction has stalled, forcing inventories to shrink. The author of course argues that there is a massive number of homes yet to hit the market - people are just waiting until their equity values turn positive. NY Times: - High unemployment, poor jobs, stagnating wages and tight lending standards keep buyers away, while many sellers — especially the estimated 13 million homeowners who owe more on their mortgages than their homes are worth — are waiting for a price rebound. Of course there are millions waiting to sell their home. But once these homes are no longer "underwater" and the owners sell them, where are they going to move? The sellers will go out and buy another home - maybe somewhere else in the US. Some argue that many families will start renting once they get rid of their "underwater" house. Unlikely, but those who do will find a tight rental market - there are not many homes for rent and rents are up materially. And to put more rental homes on the market the landlords have to buy these properties somewhere - taking them out of the available inventory. 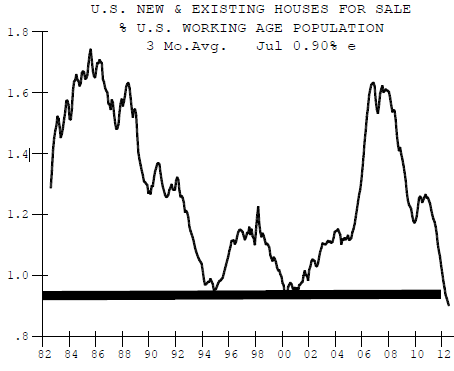 The point is that the US demographics now drive the housing market - more so than the US economic growth. It is not the closed system that the NY Times describes because the demand grows with population. With new home construction remaining weak, there are simply fewer places to live - only so many people can live in someone's basement. Available housing inventory per working-age person in the US is now at a 30-year low (at least). It is not "a chicken-and-egg problem". The housing market and the US economy are now far less coupled together than in the past, when strong housing markets generated construction based growth. And just as demographics more than the economy now drive improved demand for homes, a better housing market will not have the same positive impact on the economy as it did before the financial crisis.